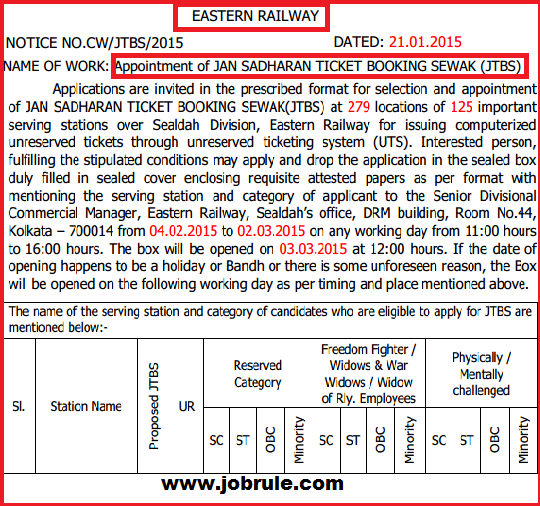 Eastern Railway, Sealdaha Division Appointment of Jan Sadharan Ticket Booking Sewak (JTBS) for 3 Years. Application in prescribed format are invites from interested persons for appointment as ER Sealdah Division Jan Sadharan Ticket Booking Sewak (JTBS) at 279 locations of 125 important Railway serving stations over Sealdhaha Division, Eastern Railway for issuing computerized unreserved ticket through unreserved Ticket System (UTS). Interested persons, fulfilling the stipulated conditions may apply and drop the application form in the sealed box duly filled in sealed cover enclosing requisite attested papers as per format with mentioning the serving station and category of applicant to the Senior Divisional Commercial Manager, Eastern Railway, Sealdah’s Office, DRM Building, Room No-14, Kolkata-700014 from 4/2/2015 to 2/3/2015 on any working day from 11:00 Hours to 16:00 Hours. The Tender Box will be opened on 3/3/2015 at 12:00 hours.